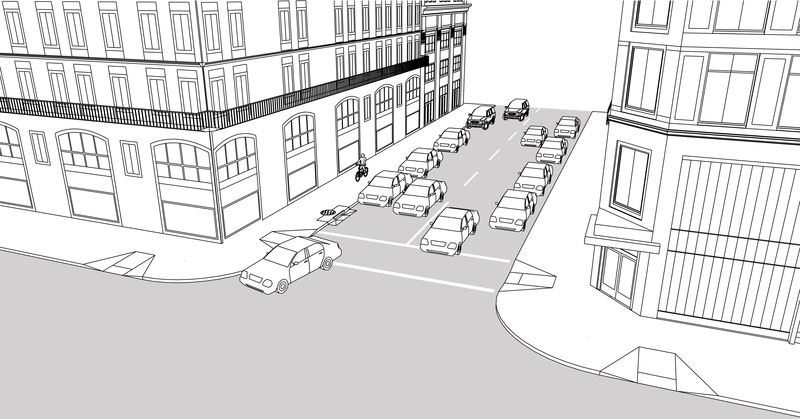 Shared streets prioritize walking over all other movement, while allowing motor vehicle access at extremely low speeds. Many narrow or crowded downtown streets operate informally as shared streets during rush hour or at lunchtime, but are not regulated as such. Commercial shared street environments are most suitable in places where pedestrian activity is high and vehicle volumes are either low or discouraged. The illustrated condition serves underutilized commercial destinations. Sidewalks are narrow, often blocked, and the street is alternately crowded or deserted depending on the time of day. On some wide downtown streets, speeding and cut-through traffic are an issue, while on especially narrow streets, loading trucks block motor vehicle access entirely. A flat street grade results in frequent standing water on the street, especially at low points such as curb ramps, gutters, and corner apexes, rendering the street inaccessible on a periodic basis. Shared streets prioritize public space while providing safe access to all modes at very low speeds, with priority for people walking. Critically, these designs maintain access for loading and deliveries, and accommodate other motor vehicles. Design cues and local activity slow or divert traffic. 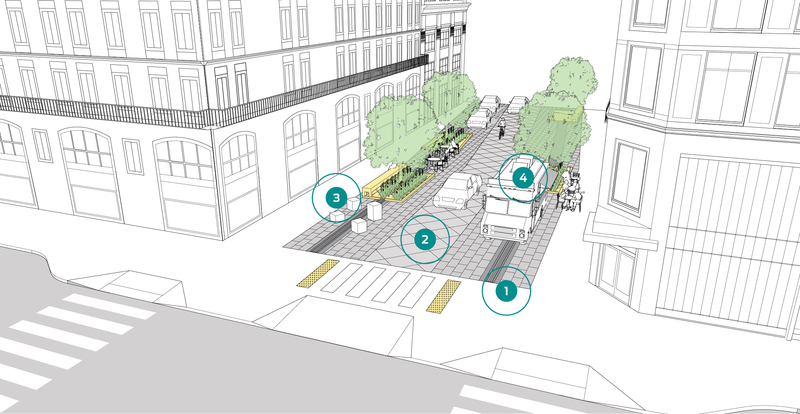 A curbless pedestrian and vehicle space with textured or permeable pavement reinforces the pedestrian-priority operation of the street. Use materials and vertical elements to delineate a shifting path of travel or narrow carriageway to encourage low speeds. Special pavements, especially permeable interlocking concrete pavers, may be subject to additional maintenance costs and should be selected based on regional climate and long-term durability. Selection of snowplow-compatible materials is recommended for colder climates. Valley gutters or trench drains direct runoff to bioretention planters, and may be designed as detectable and high-contrast edges to delineate the shared roadway from the exclusive pedestrian paths. 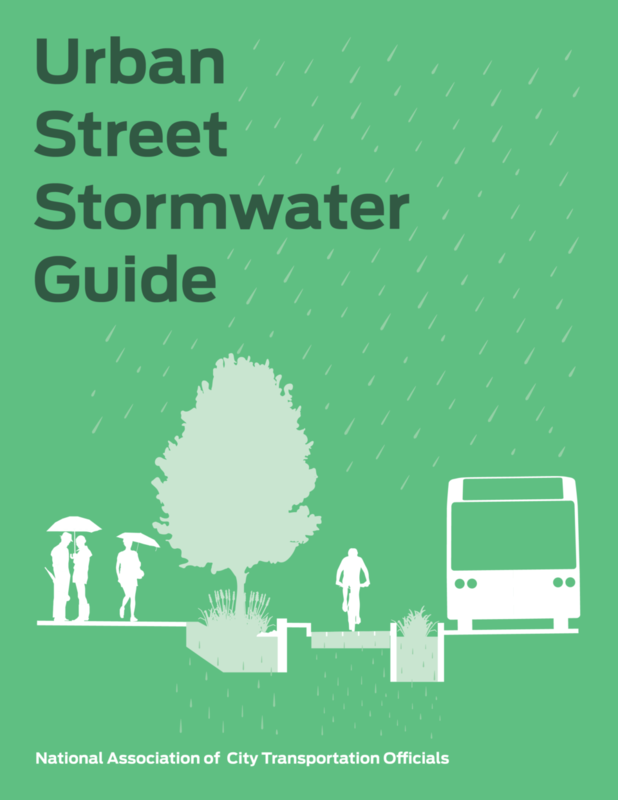 If permeable pavement is used across the full roadway, design street grade and cross slope to channel water that does not infiltrate through the permeable pavement to flow to an approved discharge point. Street furniture, including benches, planters, street lights, sculptures, trees, bicycle parking, and bollards if necessary, should be placed along the edge of a pedestrian-only space, subtly delineating the traveled way from the pedestrian-exclusive area. This edge should be designed carefully to be navigable by people who are blind or have low vision. Local or state regulations may need to be enacted to enable shared street operations and enforcement, but designs should be self-enforcing on any shared street. Commercial shared streets can be designed for a variety of widths, but the shared space itself should be kept narrow to limit traffic speeds. On narrow shared streets and alleys, the entire surface is shared, and serves as the accessible pedestrian path, with a strict maximum speed of 5–10 mph. On wider streets, consider providing a pedestrian-only clear path in place of a conventional sidewalk. Bollards, paving materials, and street furniture help to define parking spaces and delineate pedestrian and vehicular space. Use staggered blocks of landscaping, bioretention facilities, or angled or perpendicular parking can be used to create a chicane effect. Special care should be taken to help visually impaired users distinguish zones which may be traversed by vehicles. Bioretention facilities may need to be lined to prevent groundwater migration into adjacent structures and underground utility trenches. Review the condition of adjacent structures such as basements and utility corridors during the survey and planning process to determine seepage risk. Commercial shared streets should be accessible to single-unit trucks making deliveries. 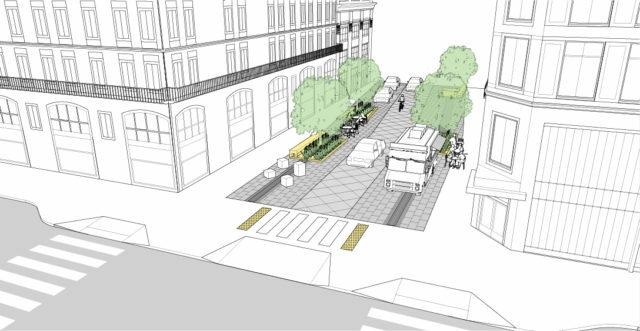 Where commercial alleys are non-existent, it may be advantageous to design a shared street to accommodate large trucks as a control vehicle (not a design vehicle), though significant changes to the design should be avoided. Designated loading zones may be defined through differences in pavement pattern or use of striping and signage. Provide tactile warning strips at the entrance to all shared spaces. Tactile warning strips must be placed where the accessible path of travel intersects with the motor vehicle travel path, as shown in the illustration above. On true single-surface streets without an exclusive pedestrian zone, warning strips should span the entire intersection crossing. Use parking management strategies to ensure that parking activities and occupancy are suited to the commercial activity serving the street. Provide dedicated space or time of day for loading and deliveries, and site green infrastructure to allow up to a single unit delivery vehicle to access and load at commercial locations. Partner with adjacent businesses or a business improvement district for programming and maintenance.